The Chanelle 1.5 Carat Cushion Cut Cathedral Cubic Zirconia Double Prong Micro Pave Solitaire features a 1.5 carat 7mm cushion cut square set with split prongs on the center stone. Three rows of micro pave set rounds are delicately hand set halfway down both sides of the cathedral styled shank. The cathedral ring mounting flairs up towards the top of the center stone, adding that something extra design elements to its already classic and simplistic design. 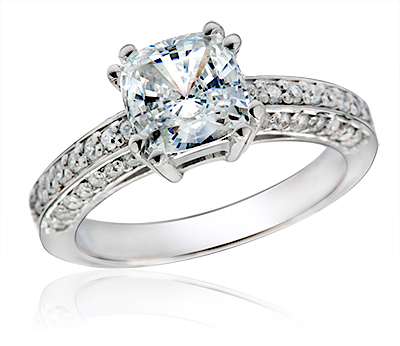 Check through our bands selection for a style you feel will best compliment this cushion cut solitaire. You can team this diamond look cubic zirconia cushion cut square solitaire style engagement ring with any of our bands, including eternity bands and anniversary bands. 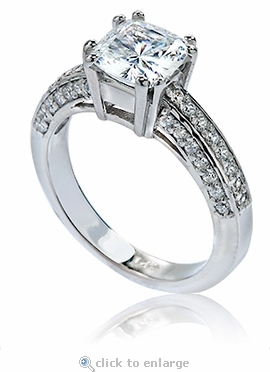 The double prongs on this center stone enhance the elegance of the cushion cut center stone in addition to the micro pave encrusted raised cathedral shank. 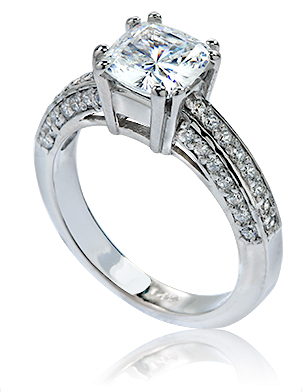 The Chanelle Solitaire includes approximately 2.8 carats in total carat weight of the finest hand cut and hand polished original Russian formula cubic zirconia and the shank measures approximately 3.3mm in width. This item is a clearance item. Due to extremely low pricing, all clearance sales are final. Sizes below a 5 or above an 8 can be made via Special Order. Please call 1-866-ZIAMOND for a quote.